The Essence of the New Testament surveys the books from Matthew to Revelation. Based on decades of scholarly research and classroom teaching, a team of biblical scholars from Liberty University provides a practical, readable, and insightful introduction to the second major division of the Christian biblical canon. This uniquely illustrated, full-color volume features book introductions, background studies, outlines, surveys, theological concepts, practical applications, study questions, and helpful word studies. Editors Elmer Towns and Ben Gutierrez draw from their lives as teachers to provide a well tested and proven New Testament overview written at the collegiate level, yet appropriate for pastors, scholars, and laymen alike. They represent the finest evangelical scholarship along with a passion to open windows of spiritual and practical insight into the biblical text. 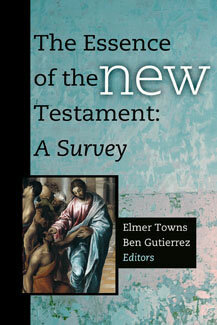 This exciting new survey of the Scriptures highlights the key elements of the New Testament. The history, archaeology, and wisdom of the biblical world are revealed with an eye on the application of their moral principles, theological insights, and practical application to today’s world. Ben Gutierrez is administrative dean for undergraduate programs at Liberty University in Lynchburg, Virginia. He holds a Ph.D. in Organizational Leadership & Divinity from Regent University.